Spacious Victorian two-bedroom apartment in quiet central location. Free on-street parking. Spacious accommodation in a comfortable two-storey Victorian flat. Rosslyn Crescent is a secluded street close to Leith Walk, with free unrestricted on-street parking and a regular bus service to the city centre (or a 20-minute walk to Princes Street if you prefer to go by foot). The apartment has two double bedrooms, a large living-room with dining table in the bay window, a well-appointed kitchen (with dishwasher, electric oven, gas hob, fridge and freezer) with kitchen table and dining chairs, a utility room with a washing machine, and a private garden. The bathroom has a bath, separate shower, WC and hand basin. There is also a separate cloakroom with WC and a rack for drying clothes. Access is via an internal stair from the ground floor; the accommodation is on two levels (some rooms are not open for guests). The apartment has gas central heating/hot water, and the price of electricity and local taxes is included. n.b. A single blow-up mattress is available if required; there is an extra charge of £20 for the bed linen. Rosslyn Crescent is set around a mature garden of specimen trees, known as the Plantation. Because the street is a cul-de-sac there's little traffic and it's very peaceful, yet it's only a 20-minute walk to the city centre. Theres a regular bus service to Princes Street and beyond from the end of the street, and yet more buses a short walk away on Leith Walk. Pilrig Park at the end of the street has connections with Robert Louis Stevenson's family, and the nearby Water of Leith is another pleasant place to walk. Rosslyn Crescent leads off Pilrig Steet, which marks the boundary between Edinburgh and Leith. Leith is the port of Edinburgh and was once a separate town until in 1920 a hastily organized local referendum (the so-called 'Arranged Marriage', with Leith the reluctant bride) brought Leith under the administrative rule of its neighbour. Edinburgh has a reputation as a city of contrasts. The city that spawned Deacon Brodie, the original Jekyll and Hyde character who inspired Robert Louis Stevenson's novel, could hardly be anything else. Burghmaster by day and petty thief by night, Brodie personifies the contradictions and contrasts so evident in Edinburgh today: from the Deacon's descendant Miss Jean Brodie enjoying her prime to Irvine Welsh's characters squandering theirs in Trainspotting, the city has a rich tradition of diversity. Leith Walk, the long street that links Edinburgh and Leith, is no exception: foodie delicatessens rub shoulders with greasy-spoon cafés and you can go from Italy to China in the space of a few blocks. Leith Walk is the umbrella name for a series of differently named streets and terraces. 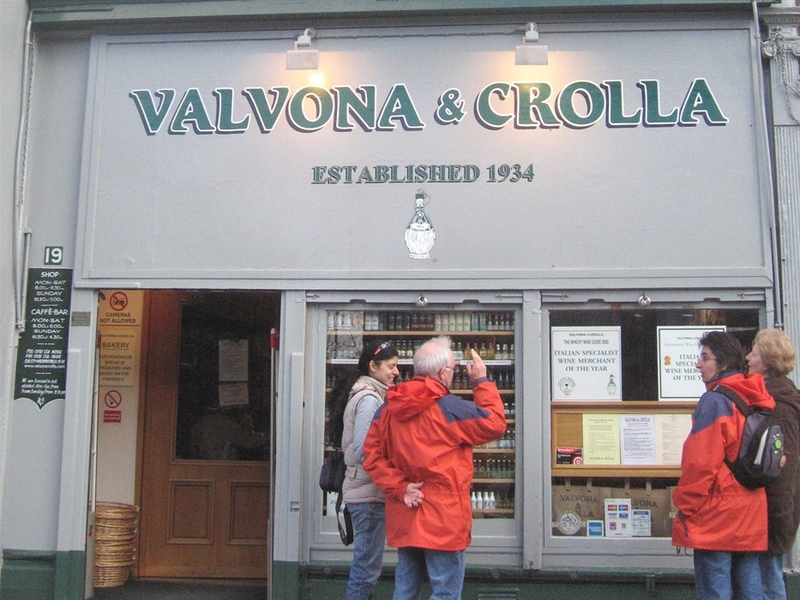 On Elm Row at the top of Leith Walk is Valvona & Crolla, one of Britain's top Italian foodshops. The shopfront boasts 'Founded in 1934, Origins in 1860s' and those years of tradition are evident the minute you step inside: hams hang from the ceiling, floor-to-ceiling shelves strain with Mediterranean delicacies and you can often hear Italian being spoken. The shop is still owned and run by descendants of the Crollas and Valvonas who set it up in the 1930s. The shop also has a café where you can sample the cuisine of Mary Contini, one of Britain's premiere food writers and chefs. The shop plays a role in the Edinburgh Festival each August, when it becomes a venue for Italian music and drama. The Italian theme continues on Albert Street at the Sicilian Pastry Shop. The Boundary Bar at the top of Pilrig Street straddles the boundary of Edinburgh and Leith: when the two towns kept different licensing hours a move from one end of the bar to the other meant that you could carry on drinking in Leith long after last orders had been called in Edinburgh. At the bottom of Leith Walk is the site of the old Leith Central Station, which forms the key image of Irvine Welsh's influential novel. Nearby, along Great Junction Street, is Leith Victoria Swim Centre, which has a swimming pool and gym. A couple of streets from here is The Shore, Leith's waterfront area, once decaying but now enjoying a renaissance. Many of the old industrial buildings have been converted in to apartments and offices to house a new generation of residents and businesses. There are lots of great places to eat and drink, which come in to their own in the summer, when they spill out in to the streets; you can even eat and drink al fresco.